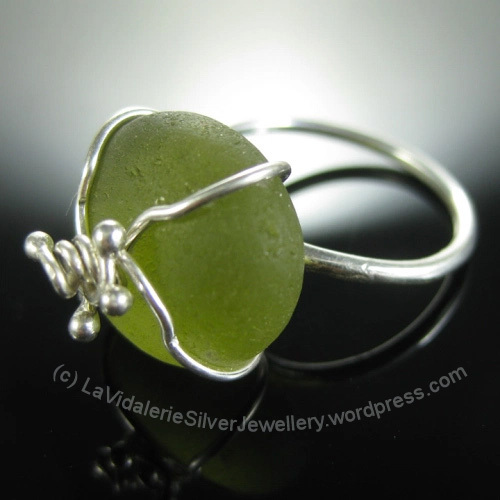 What a fun and imaginative piece of sea glass and silver jewelry. I love the beautiful roundedness of the green glass. It almost looks like a piece of candy. The amazing thing is jewelry maker and teacher, Karen of LaVidalerie.com shares exactly how she made it and how anyone else could do it too! In 2008 we started running our jewellery making holidays, from beading to silversmithing to absolute beginners to those wishing to develop their skills further. My passion for handmade jewellery and Tim’s huge range of building skills have given us the chance to live in this very beautiful and unknown part of France. View more of her beautiful and unique hand-fabricated rings via her online gallery. And learn more about her jewelry-making workshops via her workshops page.